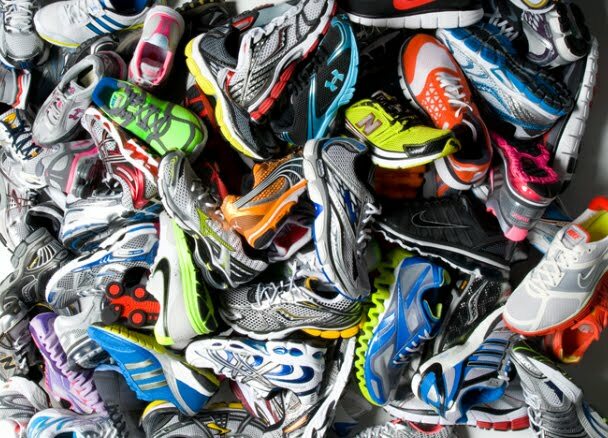 What is involved in your process for buying new athletic shoes? Are you a form over function kind of person, driven by sales, wait to buy new shoes until your old ones have holes, are you loyal to a particular brand only? I’m going to share some tips and tricks to find you the very best athletic shoes for both your feet and your intended activity – and those really are the two biggest things that should be driving your decision making process regarding athletic shoes. The first thing to consider is what activity you’ll be using the shoe for. Walking and running shoes are designed for forward motion only, meaning they won’t be a great choice if you’re doing anything involving lateral, or side movements, like dancing for instance. It really will make a difference to get the right shoe for the activity you’ll be doing. For classes at Fitness with Rachel when shoes are recommended, I’d suggest specifically looking for a cross-training shoe. Is there enough room in the toe box for a bit of expansion should your feet swell? Your toes shouldn’t hit the end and you want to be able to wiggle them around a bit. Is the heel snug? Opposite the toe area, you want the heel to fit fairly snug, to avoid excessive rubbing and potential blisters. Do I feel stable in the shoe? Try a single leg balance both in and out of the shoe. If it’s noticeably harder to balance while wearing the shoe, put it back. Can you twist and pivot and have your foot feel like it’s staying where it’s supposed to in the shoe, and the sole of the shoe doesn’t feel like it’s sticking too much to the floor? Is there enough cushioning? Give a little bounce or jump, landing on the ball of your foot, and again toward the heel area. If the shoe feels too hard, put it back. Does the shoe feel heavy on your feet? Do some high knee marches. Generally speaking, lighter shoes will be more comfortable during longer activities. After all this testing, are your feet already getting sweaty? Breathability will make a big difference in how your feet feel. Final assessment – mentally check in with all the areas in the shoe that your foot is in contact with. Does anything feel weird – lumpy, bumpy, sharp, pokey, pinchy? If you’re shopping for a walking or running shoe, hitting up a store that can examine your gait would be a great idea. Trying on shoes, and lots of them, will be super helpful. Department stores, outlet stores, athletic stores are all great first stops. If you’re like me and hate to shop, I suggest online shopping from a retailer like Amazon or Zappos who have free returns. Get a dozen pairs, try them on in the comfort of your own home, and ship back what you don’t like. Don’t be afraid to send them all back and try again. These might be some starting points for you in your search, but in order for your feet to feel their best, please don’t let them be your primary goals in athletic footwear. You might find that one brand tends to fit your feet best – and if so, that definitely will make a new search that much easier. But don’t stay brand loyal if you find that changes or quality goes down! 3 times a week? Get a new pair of shoes every 5 months. 4 times a week? Then invest in a new pair every 4 months. 5 times a week? New shoes every 3 months for you! Yes, you can extend that time if you are rotating multiple pairs of shoes, and you might be able to get some more time with a new pair of insoles (somewhat risky though, as they can change how the whole shoe fits). But if you have shoes that are more than a year old, they’re likely past their prime. By the time your shoes look worn out, they are well past that stage! You might not be able to find a shoe that ticks all your boxes of fit, style, and price, but getting as many as possible and prioritizing fit will really make a difference in how your entire body reacts to a workout – both during and after – so it’s worth taking the time (and spending the money) to get it right.